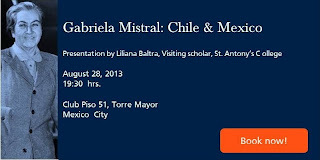 Gabriela Mistral, (1889- 1957) was the first author from Latin America to be awarded the Nobel Prize of Literature in 1945. She was a humble school teacher from the Elqui Valley, North of Chile. Almost a self-made woman, she started writing at the age of 6 and was publishing poetic prose in local newspapers and magazines at age 14! José Vasconcelos invited her to Mexico to help with the Educational Reform in 1922. That same year, the Spanish Teachers at Columbia University in New York, decided to publish her first book of Poems: DESOLACION. 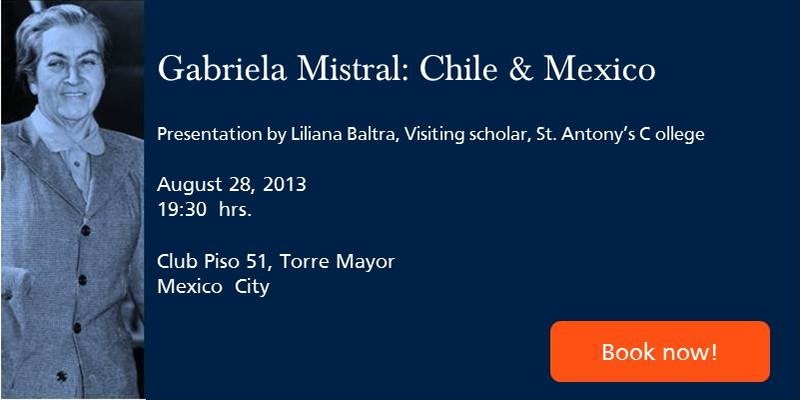 In this talk Liliana Baltra is going to talk about this extraordinary woman who contributed to the education of women and children of Chile and Mexico at the beginnings of the 20th century. After the event, please join us for drinks in the lounge.